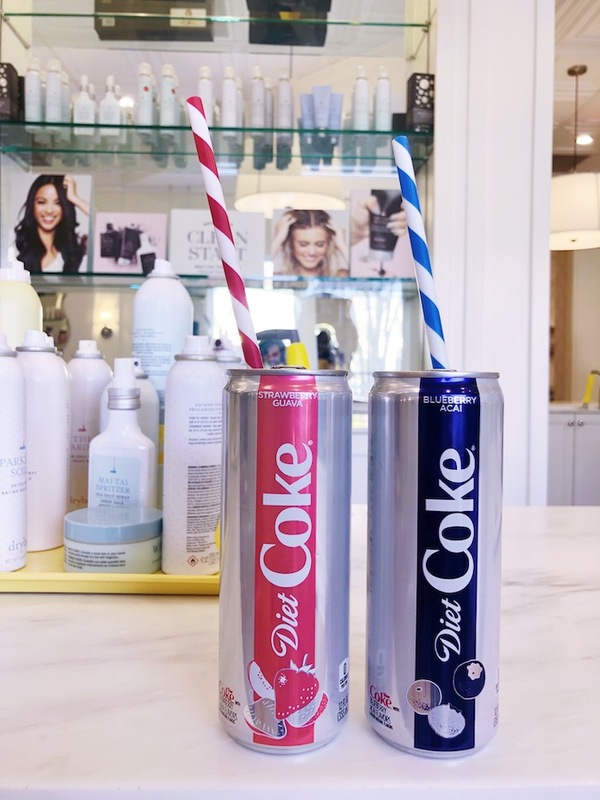 Diet Coke has recently launched two new flavors, Strawberry Guava and Blueberry Acai, and we’re celebrating with an Agenda x Diet Coke x Drybar Pop-Up this Saturday from 11:30a-2:30p (check out all the event details and snag your free tickets here). 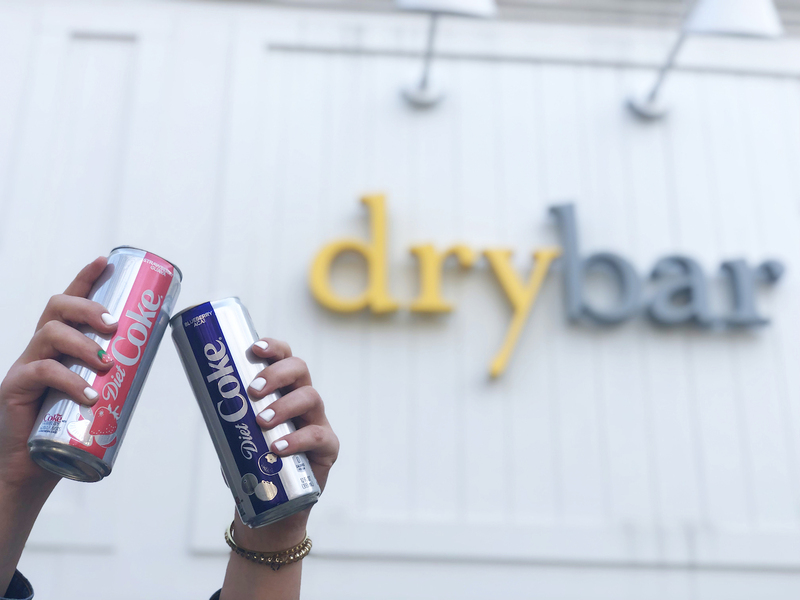 To enter: Tag who you’re bringing to the Agenda x Diet Coke x Drybar Pop-Up this Saturday in the Instagram giveaway comments. • Need a mani or pedi? Head to Anthony Vince for 10% off of a service, PLUS they’ll add a strawberry design accent upgrade for free. We’ll see you there for girls’ day. See official rules and contest details below. To enter: Enter on Instagram by Wednesday, March 27 at 11:59 p.m. Unlimited entries allowed. Winner: We’ll pick the winner by Thursday, March 28 at 5 p.m. The prize: Two VIP pop-up tickets for our winner and a friend – each ticket includes a specialty Drybar blowout with gratuity (value $90+) at 1:30 p.m. on Saturday, March 30; $50 Drybar gift card so you can take advantage of their 20% off discounts during the event; and $100 cash to make sure our winner can get all the Strawberry Guava and Blueberry Acai Diet Coke they could dream of. Eligible to legal residents of North Carolina and South Carolina, who are 21 or older at the time of entry. Unlimited entries allowed. Sponsored by Williams Media, LLC (dba CHARLOTTE AGENDA), a North Carolina limited liability company. This Contest is in no way sponsored, endorsed or administered by, or associated with, Facebook, Instagram or Twitter. You understand that your participation in the Contest is with Williams Media, LLC (dba CHARLOTTE AGENDA), and not Facebook, Instagram or Twitter and that you are providing information to Williams Media, LLC (dba CHARLOTTE AGENDA). Any disclosure you make in connection with the Contest is to Williams Media, LLC (dba CHARLOTTE AGENDA), and not to any other party including Facebook, Instagram and Twitter. Facebook, Instagram and Twitter are released from any obligation or liability in connection with the Contest. NO PURCHASE NECESSARY TO ENTER OR TO WIN. A PURCHASE WILL NOT INCREASE YOUR ODDS OF WINNING. SUBJECT TO APPLICABLE FEDERAL, STATE, LOCAL AND MUNICIPAL LAWS AND REGULATIONS. VOID WHERE PROHIBITED. THE CONTEST MAY BE TERMINATED AT ANY TIME FOR ANY REASON BY Williams Media, LLC (dba CHARLOTTE AGENDA), WITHOUT NOTICE. Accepting the Prize constitutes your full and unconditional agreement to and acceptance of these Official Rules and the decisions of Williams Media, LLC (dba CHARLOTTE AGENDA), which shall be final and binding on all matters relating to the Contest. Contest Time: The “Williams Media, LLC (dba CHARLOTTE AGENDA) Diet Coke Giveaway” (the “Contest”) begins 7 A.M. ET on March 27, 2019 ending at 11:59 P.M. on March 27, 2019. The winner will be notified by March 28, 2019 at 5 P.M.
How to Enter the Contest: Enter via Instagram comment. Unlimited entries allowed. Eligibility: The Contest is open only to legal residents of North Carolina and South Carolina who, who are 21 years of age or older at the time of entry. Employees of Williams Media, LLC (dba CHARLOTTE AGENDA), its members, managers, parents, subsidiaries, divisions, affiliates, suppliers, distributors and advertising, promotional and other agencies and any of their immediate family, as applicable, are not eligible to participate or win. Void where prohibited by law. All federal, state, and local laws and regulations apply. Prize Selection: We will select 1 random entrant from Instagram submissions. They will be notified by email or direct message on Instagram by March 28, 2019 at 5 p.m. If any Prize cannot be distributed or is returned, Williams Media, LLC (dba CHARLOTTE AGENDA), reserves the right in its sole discretion to select an alternative winner or to give the prize to charity. Odds of Winning: Odds of winning depend on number of entries received. Taxes and Other Restrictions: All federal, state, and local taxes are solely the responsibility of the winner. No responsibility or liability is assumed for any obligations, damages, losses or injury resulting from acceptance or use of the Prize or any substitute therefore. General Rules: Williams Media, LLC (dba CHARLOTTE AGENDA), in its sole discretion, reserves the right to disqualify you. All decisions relating to the Contest are final and is at the sole discretion of Williams Media, LLC (dba CHARLOTTE AGENDA). By participating in the Contest, the winner agrees to be bound by the Official Rules. Williams Media, LLC (dba CHARLOTTE AGENDA), nor any of its respective affiliates, officers, members, managers, directors, agents, or employees are responsible for ANY technical issues including but not limited to, hardware, software, or network malfunctions of any kind. Winner releases Williams Media, LLC (dba CHARLOTTE AGENDA) and its respective affiliates, officers, members, managers, directors, agents, or employees of any liability or responsibility for any claim arising in connection with participation in the Contest or the awarding of the Prize. Winner will be solely responsible for any damages resulting from any infringement of copyrights, trademarks or any other rights, resulting from your entry. Winner hereby releases and discharges Williams Media, LLC (dba CHARLOTTE AGENDA) and all affiliates, Facebook, Instagram and Twitter, from ANY and ALL claims and suits arising with your entry, including all claims for copyright or trademark infringement. Winner waives ALL rights to interfere with use of your entry or any information about you. Release of Rights: Winner grants to Williams Media, LLC (dba CHARLOTTE AGENDA), and its affiliates a non-exclusive, worldwide, perpetual, irrevocable, transferable right and license to use ANY and ALL information from your entry. Williams Media, LLC (dba CHARLOTTE AGENDA) will likely use the information you submit for promotion, stories and social media. Governing Law: The Contest and the Official Rules shall be exclusively governed by the laws of the state of North Carolina, without regard to conflicts of law provisions. Entrants submit to exclusive personal jurisdiction in North Carolina.